business cards, web design, print materials and more. 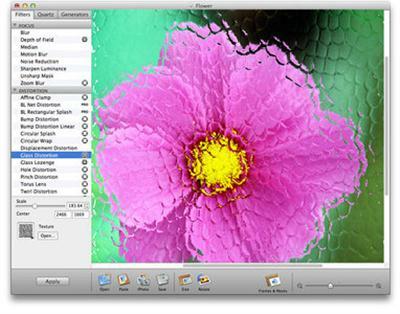 Adjust saturation, brightness, contrast, hue, adjust the color matrix, and more. Blur your picture in different ways. Distort images using Twirl, Bump, Pinch, and other effects. Stylize your art: Make Mosaic, Crystalize, use Halftone effects, etc. Use combinations of several (Mac OSX) filters called Quartz Compositions. Blend your photos into one creative artwork using so-called Overlap effects. Transform your images by changing their shape and perspective. Tile, kaleidoscope, and crop images. Add photo frames, borders, or border masks. Image Generating:Special mathematical algorithms to create original images. Handy set of controls for each generator. Render function allows to arrange objects in random order. Ability to set colors of a generated image. Key Features:Easy to use and friendly Interface. 82 Core Image effects and filters (103 in Pro version). 35 Quartz Compositions (40 in Pro version). 13 Image generators (20 in Pro version). 12 photo frames (114 in Pro version). 12 vector borders (65 in Pro version). Over 70 unique masks can be applied to an Image (225 in Pro version).